First Love Missions: Evangelist Charles Carrin Comes to Word & Worship This Sunday! 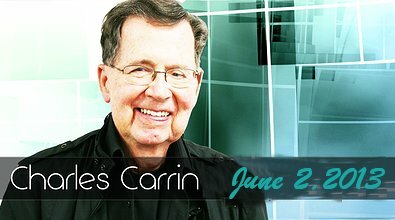 Evangelist Charles Carrin Comes to Word & Worship This Sunday! CHARLES CARRIN has been in ministry more than 50 years. He was ordained in 1949 and for the first twenty-seven years of his ministry Charles was a hyper-Calvinist Baptist pastor and Presbyterian seminarian. During this time Charles denied the supernatural works and gifts of the Holy Spirit, because of his denominational doctrine. A crisis time in his own life, his wife's tragic automobile accident and a number of converging lines of evidence from Scripture caused him to consider revising his theology. Through a miraculous encounter of ministry with a spirit-filled inmate of the Atlanta Federal Penitentiary he was gloriously filled with the Holy Spirit and walked out of that visitation room with a power he had only heard of and read about. His ministry totally changed! Today, his ministry centers upon the visible demonstration of the Spirit and imparting of His gifts. This new ministry has taken him to London's Westminster Chapel, the Toronto Airport Christian Fellowship, and other significant places. He, R.T. Kendall, the former, 25 year pastor at Westminster Chapel, and Jack Taylor, former Vice President of the Southern Baptist Convention, travel together holding "Word, Spirit, Power, Conferences." As an evangelist/writer, Charles' articles have appeared in major Christian magazines in the United States and abroad. He travels extensively, teaching believers how to operate in the power of the Holy Spirit. Join us this Sunday, June 2nd 2013 for a very special guest at the Word & Worship Center at 8601 SW 199th St. Cutler Bay, Fl. 33189.